Ooh, it’s a quandary, isn’t it? Whether or not to ‘launch’ your book or let it slowly slide out into the world like a beached whale getting picked up by the tide once more? Whether to tour around flogging your wares or to concentrate on getting the next thing written and letting the stories do their own marketing? For my most recent book, Dino Wars: Rise of the Raptors, I had thought long and hard about doing a book launch; a local cafe and caterer had offered their space but frankly my imposter syndrome kicked in and I felt unworthy to hold my own party and blow my own trumpet in this way. I’ve a few books under my belt now but I’m still very much a minnow in the world of kid’s lit, so I felt uneasy launching the book to a great fanfare – and who would come? 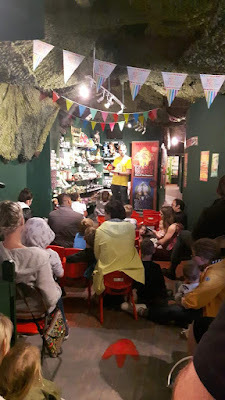 No, I felt more comfortable (for some reason) booking a small tour of events in the May half term where I would stand in front of complete strangers and tell jokes, read parts of my book and play silly balloon games with the assembled children. 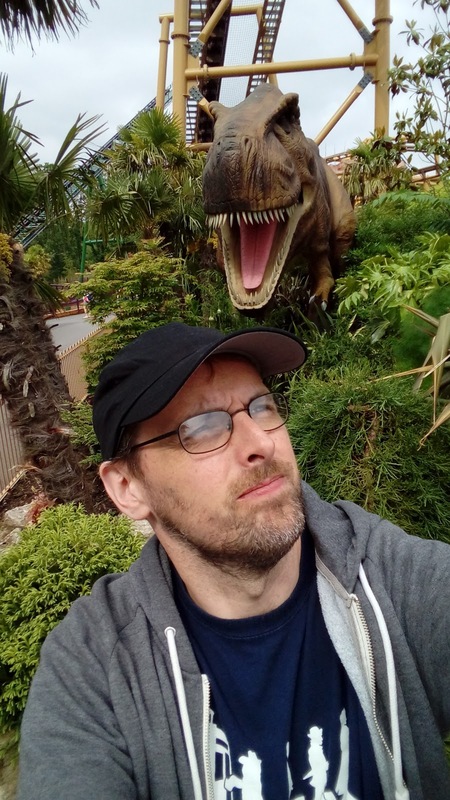 I set about finding places to hold them and soon found a few Dinosaur related venues – I live in Devon, which plays up its tourist destination of the Jurassic Coast well. Soon I had book events at the Dinosaur Museum inDorchester and Torquay's Dinosaur World. This is where my experiences become a cautionary tale. Yes, my choice to go to dino-related venues was undoubtedly genius, (Okay, first suggested by my wife) but they bring their own challenges. Most are small affairs and have little space in which to hold events; an event in another fossil museum was a no-go due to lack of space. Dorchester had a cinema room which they were willing to hand over to me for my hour sessions, while Torquay had to clear part of their gift shop. Also, if you’re taking up space then it may affect their footfall numbers – we did the Dorchester event while still open during the day, but made the Torquay one a ticketed event for five o’clock when the venue was closed to the public. Another challenge was the fact that museums may not have the same relationships with wholesalers that a bookshop or library might have, so it was touch-and-go whether we would have enough copies to sell. Both were well attended, largely due to the weather; it rained in Dorchester, driving families into the indoor tourist attractions, and the patchy weather coupled with it being the end of the day and parents being desperate for something to do meant that Torquay, while not packed out, was comfortably attended. Book sales were respectable – not going to bother the New York Times Bestsellers, but the venues were happy, and retained all the stock they had bought to keep in their gift shops. This means that Dino Wars is in two more places that they would have been normally, and places where children are hungry to spend their parent’s money. My evil plan to dominate the earth is coming together. Mwuh-ha-ha-haa! Two other events in a well-known bookshop chain (beginning with W and rhyming with Porterstones) were weather-dependent – one had a handful of attendees and sales (showers), while the other, on a gloriously hot day when the entire population was at the park, pub or beach, was sloooooow. Again though, the silver lining is that stock remained and is now on the shelf in these High Street vendors, which they would not have been otherwise. Another event, organised by a specialist children’s bookshop and local library, had just one attendee. It was another hot day but we had fun nonetheless. I was even told afterwards that the child had only recently gone to live with them, as he was in foster care and it was the first quality time they had spent with them, which made the visit all the more worthwhile. The half-term events? Tough to judge – I enjoyed doing them, but I’m not sure a spring-summer holiday is the best time to hold an indoor event. You live and learn. The negligible results of my self-organised, self-promoted week of events was put into sharp contrast when just a fortnight later I was taken ‘on tour’ by my local bookshop, the splendid Crediton Community Bookshop. Arranged by the formidable Cathie, I was picked up at my house by their schools volunteer team and driven to ten schools over four days, speaking to over 800 children in years 2-5. The end of the week was topped off by a creative writing workshop in the bookshop after school for 17 children. Results? Amazing. Cathie had a prediction (based on years of experience) that for every three children we saw, we would sell one book. This ratio worked perfectly: if I spoke to 180 children, we sold 60 books. If I spoke to 30 children, we sold 10. 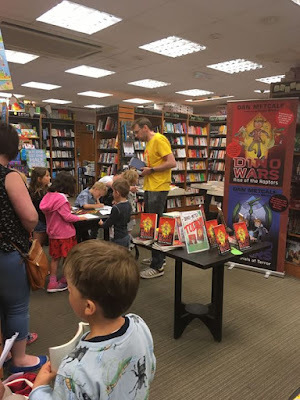 This didn’t quite work out at one book a child; a great deal on my Lottie Lipton Adventures saw many buying three books for £10, but we sold a handsome amount of Dino Wars too. There were a few challenges; miscommunication with the school meant that we weren’t able to stay after school as they wanted, meaning that some children may have been disappointed. This blow was softened by the bookshop handing out a £1 voucher to be used in the shop to every child. Some schools had promoted the visits more than others. Those that had talked the visit up in class and used some learning time to read my books to the children and research me (via my website) got a lot more out of the visit, and we sold a lot more books. Some children however entered the hall with looks of confusion on their faces and no money in hand – the staff insisted they had sent home an email or text to parents to inform them of my visit, but as Cathie put it, ‘Pupil pester power is the best promo tool’. Lessons learned? Perhaps that I, as solo worker trying to write and promote at the same time, have not got the time to do it all. Visits are far more effective when a) organised and promoted properly and b) when the children have no choice but to turn up (I.E. Schools). The location of the event also has an amazing effect on how the children behave; in schools they are involved, better behaved and more interactive. In a public setting around parents they clam up and will barely say hello! Now where did I leave that T-Rex? This may not be news to a lot of you, but I thought it prudent that I note down these observations for myself even if not for anyone else. Anyway, aside from a couple of school visits that was my ‘launch’ event programme for Dino Wars: Rise of the Raptors. Now I can sit back until at least September, when Dino Wars 2: The Trials of Terror is released and the whole thing starts again! Authors! What’s your experience of school visits / bookshop tours / alternative venues? What works best for you? Let me know in the comments and share with your peers! You can never tell what's going to happen at one of these events. I've been to schools in very rich areas where the organising bookshop didn't even sell enough to cover the cost of the petrol, and some schools where I'm assured the children do not have 'a book buying culture' where they bought tons. They just dragged their parents in at going home time and made them hand over the money. Good luck with Dino Wars 2. It's shaping up to be a fabulous series. Like Saviour, I've had unexpected experiences in schools on plus and negative sides. I had an event in that W version of Portorstones in London with a rabbit themed book in the Easter holidays, with craft activities promised and provided by the publisher. I spoke to three children and sold one book (it was a sunny day, if that is of relevance), but neither publisher publicity person nor the bookshop seemed bothered by that apparent failure, and I signed a big pile of the books for them to then have in stock. Odd.